The 11th Annual Joey Coulter Charity Race Weekend wrapped up on Sunday under overcast skies although the temperature was comfortable while the racing action was downright hot. 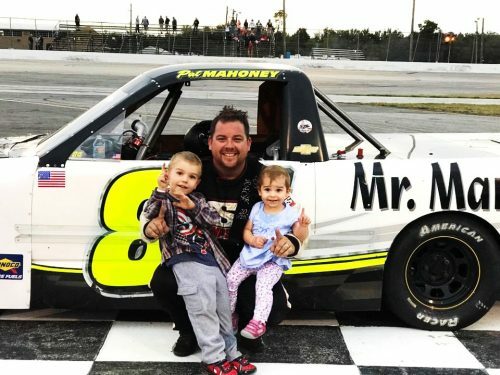 The 200-lap Charity event for the Pro Trucks was competitive and interesting from start to finish and, when all was said and done, a new face graced victory lane for the event. Ten O’Reilly Auto Parts caps were spread out during the driver’s meeting before the race and each driver from the top ten in Saturday’s qualifying picked a hat with the number inside indicating where they would start on the grid for the 200 lapper. Fast qualifier Michael Goddard chose to pick first and, as luck would have it, picked the hat with the number one meaning he would start from the pole. Jason Lester drew the hat with number two and would flank Goddard at the start on the front row while Tommy Kelly and Cody Martell made up row two. After the on-track autograph session and pre-race ceremonies it was time to go racing with event Grand Marshal Dave Dion giving the command to fire the engines. Dion then joined flagman Julian Mullis and dropped the green flag for the race as pole sitter Goddard quickly streaked out to a nice lead. The race immediately began being a bit “chippy” with plenty of bumping, banging and “leaning” going on nearly each and every lap. Four caution flags flew during the first 35 circuits with the worst incident coming on the fifth lap as young Virginia driver Garrett Manes backed his truck hard into the turn four wall. The damage to Manes’ truck was extensive and he became the first driver out of the race. Several other trucks received damage early on as well but kept going including Kristen Clements who had crinkles on both ends of her truck. Lester made several pit stops with his “Scooby Doo” truck but stayed in the running. Cody McDuffie was looking strong in the early going until his engine blew going down the back stretch on lap 53 bringing out the red flag so track crews could clean up fluid spilled on the surface by McDuffie’s machine. All the while it was Goddard looking only in his rear view mirror as he was leaving the field in his wake. However the old saying that “you can be fast but ya gotta last” reared its ugly head as Goddard slowed off turn two during lap 59, victim of a broken transmission. That handed the lead to Tommy Kelly but he had several other drivers beating on his tailgate. Cody Martell spun on the front stretch during lap 75 to bring out the yellow flag. Just as the green came back out, Billy Carlbert, Jr. slowed off turn four and stopped in the infield. 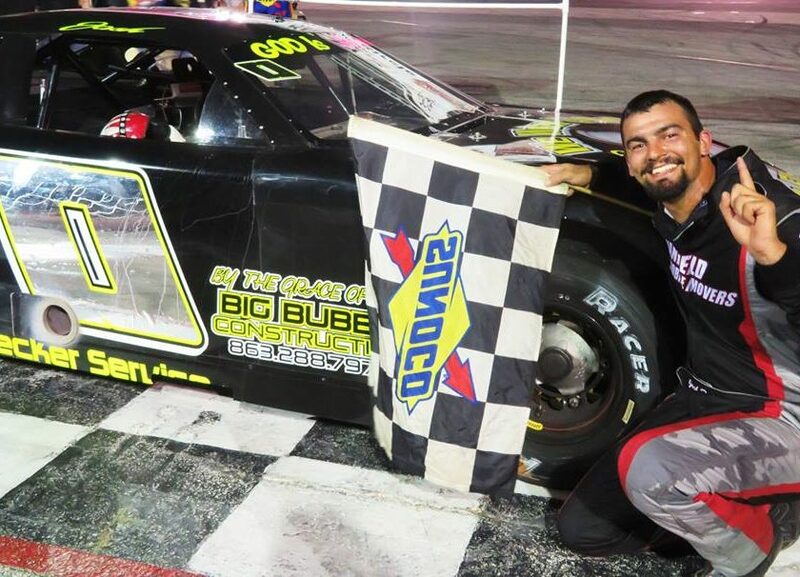 Brent Huber had been steadily moving his Mr.
Marcite Special forward from his seventh starting spot and he took the lead away from Kelly on lap 90 bringing three-time Charity Truck winner Steve Darvalics with him. Veteran Joe Winchell was also having a strong run and he passed Darvalics for second with Tommy Styer in tow as Darevalics fell back to fourth while Kelly slid to fifth. After Jessica Murphy spun on lap 93 it was decided to stop at that point for the mid-race break of 20 minutes. Teams could change two tires and make any other adjustments that they could during the allotted time. The top ten at the time were Huber, Winchell, Styer, Darvalics, Kelly, Becca Monopoli (up to sixth after starting 23rd), Jessica Coulter, Jessica Murphy and Kohut. The race was barely back under way when a major mess took place heading into turn three. Chase Lovelady was the only driver eliminated from the race but several trucks had damage including those of Cody Carlbert, Kohut and Ray Black, Jr. The race restarted on lap 106 and Huber built up a full straightaway lead before Black spun his truck in turn two during lap 123 to bring out the caution. On the restart several trucks got bottled up in turn three with Darvalics spinning after being hit by the machine of Jessica Coulter. Coulter’s truck had some front end damage but neither she nor Darvalics were penalized for their involvement as another truck “checking up” ahead of them took the blame for the incident. Huber continued to lead easily as caution flew again on lap 146 as Murphy’s truck came to a halt at the top of turn two. She pitted quickly and came back on the speedway to continue. Styer had the outside lane for the restart and he threw everything he had a Huber even leading one lap before falling back to fourth behind Darvalics and Monopoli. Something went awry with Styer’s machine on lap 168 and he drove to the infield while Monopoli continued to hold her ground, turning consistent laps despite a very sick-sounding engine. A caution for debris on the track on lap 189 proved to be Monopoli’s undoing as her truck just did not have the speed to keep up. Huber continued to streak away with Darvalics in tow as Kelly, Coulter and Winchell all got by Monopoli’s struggling machine. That would be how they would finish as Huber took the checker .646 seconds ahead of Darvalics. Kelly held off Coulter for third while Winchell took fifth. Monopoli managed to come home sixth trailed by Jessica Murphy, Sam Scott and Devin McLeod, all on the lead lap. 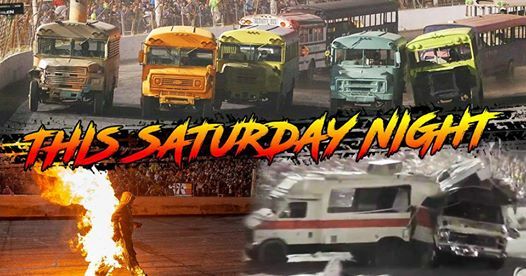 Jason Lester proved to have the “unseen drive of the night.” With Scooby Doo gracing the side of his truck, Lester, interestingly enough, got the “lucky dog” award eight times as being the first truck one lap down. He would end up one lap down at the finish in tenth place. Huber was emotional in victory lane as he was joined by his wife and two young children, embracing them while saying he was blessed to have a happy, healthy family as he raced for those who are struggling with illnesses. At the end of the night, Huber and his truck owner Pat Mahoney donated the entire $3500 winner’s purse back to the families being helped this year. Many other teams also donated all or a portion of their winnings as well. Both the winning and second place trucks were built and partly sponsored by Joe’s Garage of Venice. The day ended with a very entertaining Scrambler feature. Although Shane Bennett led every lap to claim the victory, it did not come easy as there was plenty of good racing behind him. 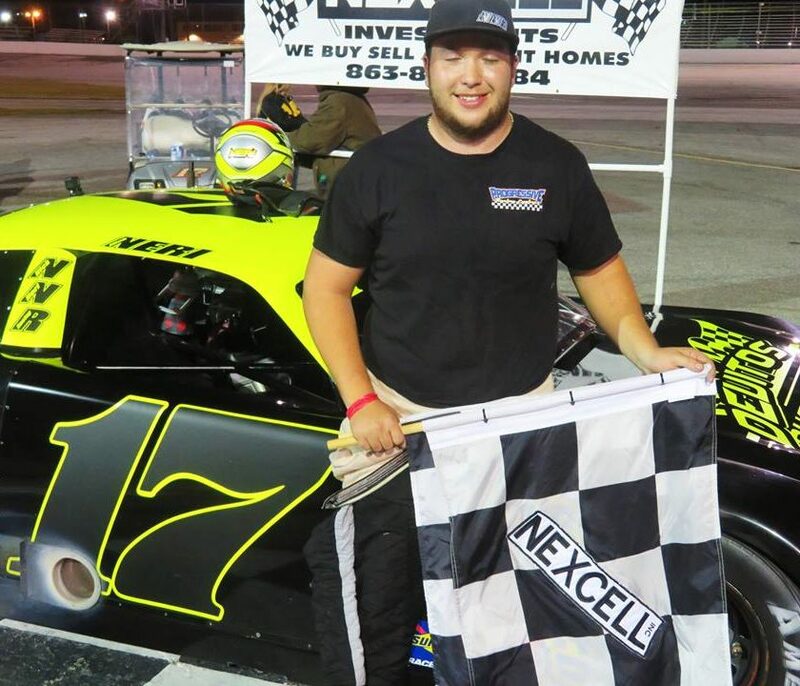 After the dust settled it was Saturday winner Dustin Wilson netting second in front of Glen Swanson, William Kerns, Bruce Cozad, Larry Crisp, Ryan Walters and George Ingram.